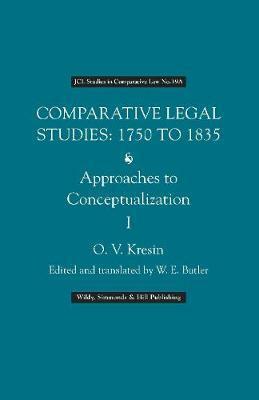 A revisionist interpretation of the origins of comparative law as a discipline, these volumes reconsider the period from 1750 to 1835 and take the origins of "legal comparativistics" back at least eight and a half decades in comparison with traditional understandings of the history of comparative jurisprudence. The influence of Hegelian approaches is much in evidence in this study. The transformations that occurred were propelled by the secularization of natural law. Legal knowledge separated itself from philosophy and became a positivist, social, and empirical legal science. Volume One addresses the historiographical, theoretical and methodological foundations of comparative legal studies, the scientific approaches to periodizing the history of comparative legal studies, conceptualization of the theoretical grounds of comparative legal studies, the prerequisites and context of the theoretical foundations of comparative legal studies, transformation of concepts on natural law, and the forming of doctrines of national law. Volume Two addresses the origins of the theoretical foundations of comparative law, and then turns to the roles of the Individual and the Universal in developing a comparative legal scientific picture of the world, with attention to the Particular in Law and the classification of national legal systems. The reconsideration of approaches to comparative-legal conceptualization is accompanied by an extensive Bibliography of sources. Oleksiy Kresin is a leading Ukrainian comparative lawyer; Head, Center of Comparative Jurisprudence, Koretskii Institute of State and Law, National Academy of Sciences of Ukraine; Associate, International Academy of Comparative Law; Secretary-General, Ukrainian Associate of Comparative Jurisprudence; President, Ukrainian National Committee, International Association of Legal Sciences.